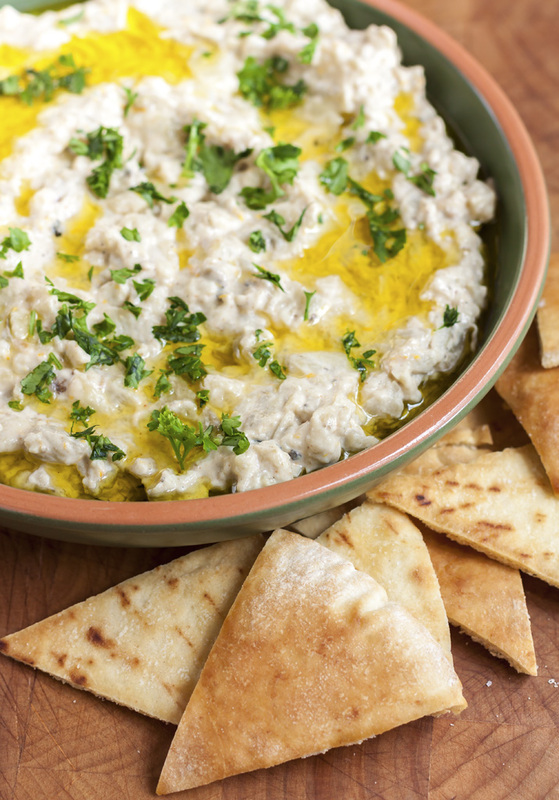 The name, whether you spell it “baba ganouj,” “baba ganouge,” or “baba ganoush,” is pronounced the same and though there are many variations, it’s all the same dish – a Mediterranean classic with a fantastic smoky-lemony flavor. Our version of the dish replaces some of the tahini, a paste of ground sesame seeds, with low-fat yogurt, giving it a lighter, silkier texture, with a corresponding reduction of calories. And for a final show-stopping and surprising flavor booster? A few drops of rich, earthy organic black truffle oil, which enhances the smokiness and subtle sweetness of the grilled eggplant in a marvelous, unexpected way. One final note: don’t be tempted to use a food processor when chopping the eggplant. 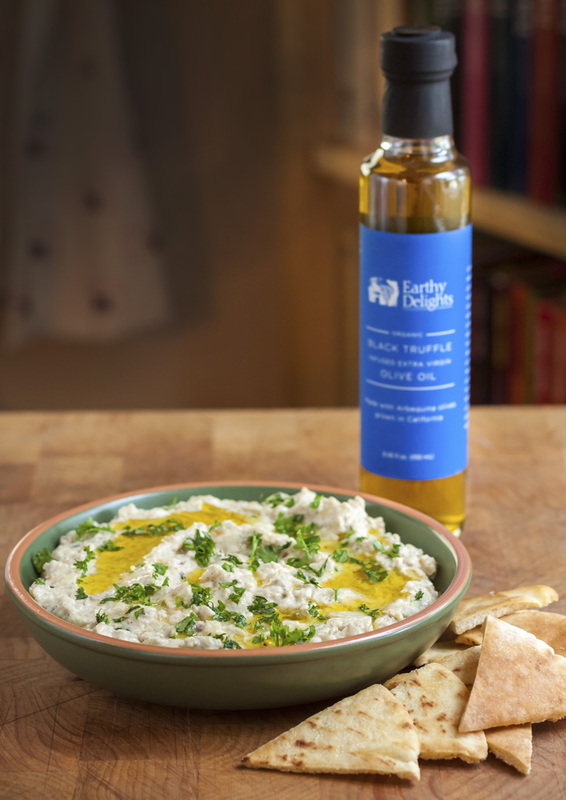 You’ll lose the texture that makes this delicious dip so appealing. It only takes a minute to do it by hand and it makes all the difference in the world. This flavor-rich eggplant puree is perfect for plunging pita chips or crudités (that’s French for raw vegetables), but that’s not all. Spread on sandwiches, it makes a quick & easy snack or toss with cooked rigatoni or penne pasta for a light lunch or dinner in under 30 minutes. Pierce the skin of the eggplant in several places with a sharp fork or the tip of a knife. Place the whole eggplant over an open fire, either on a pre-heated barbecue or over a gas burner. Cook slowly until the skin is charred, turning frequently, until the eggplant is soft and deflated, and the outside is evenly blackened. The time will vary according to your heat source, but 35 – 45 minutes is typical. 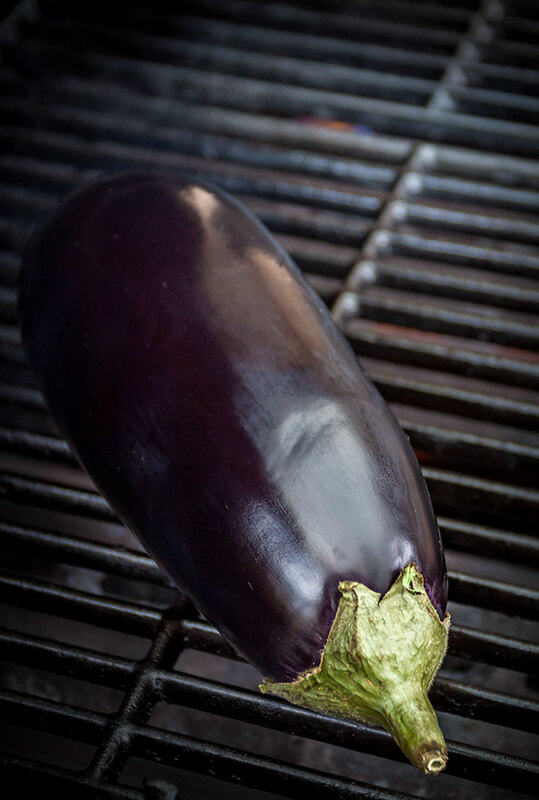 If an open flame is not available, you can cook the eggplant under a pre-heated broiler. Place the pierced eggplant on a foil-lined broiler pan and set it so the top of the eggplant is about 4 – 5 inches from the heat source. Broil, turning occasionally, until the skin is charred and the eggplant is very tender, about 30 – 40 minutes. Whichever cooking method you use, once the eggplant it cooked, place it in a pan or ceramic dish and cover with plastic wrap and let cool. Toast the cumin seeds by heating them in a heavy pan over moderate heat until they become pleasantly aromatic. Do not allow to brown. Remove from the heat and allow to cool. Place the toasted cumin seeds in a coffee or spice grinder and grind into a fine powder. When the eggplant has cooled enough to handle, peel away the charred skin, but don’t worry about getting every little bit – they’ll add to the final flavor. Remove and discard the seeds. Reserve the smoky juices that accumulate. Chop the flesh of the eggplant thoroughly, but not too finely – a slightly chunky texture is highly desirable. Stir in the garlic, tahini, yogurt, lemon juice, reserved eggplant juice, cayenne or paprika and toasted cumin, adding salt & pepper to taste. Adjust the seasonings, if necessary, then cover and chill until ready to serve. Remove from the refrigerator 30 minutes before serving and spoon into a shallow bowl. Lightly swirl the surface with the back of a large spoon and pour the olive oil over the top. Garnish with drizzles of black truffle oil, a few dashes of paprika or cayenne pepper and a generous sprinkling of cilantro and/or parsley. Adjust the oven racks to the upper middle and lower middle positions. Pre-heat the oven to 350 degrees F.
Split & separate each pita bread in half to make 2 rounds. Stack pita rounds and cut into wedges. Arrange the pita triangles, smooth-side down, on 2 rimmed baking sheets. Lightly brush the tops with olive oil and sprinkle with a little salt. Slip the baking sheets into the oven and bake the chips until they begin to crisp and toast lightly, 5 – 6 minutes. Carefully remove the baking sheets from the oven, flip the chips over, return to oven and continue to bake until the chips are fully toasted and quite crisp, about 6 more minutes. Remove the baking sheets from the oven, place on racks and allow to cool before serving. Completely cooled chips will remain crisp if stored in a resealable bag at room temperature for up to 2 days.